Highly pure (>98%) recombinant FGF1 (human Fibroblast Growth Factor-acidic). Our Abpromise guarantee covers the use of ab9588 in the following tested applications. Neutralising Use at an assay dependent concentration. 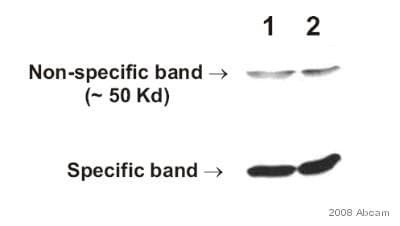 To yield one-half maximal inhibition [ND50] of the biological activity of hFGF1 (30.0 ng/ml), a concentration of 0.46 - 0.9 µg/ml of this antibody is required. The heparin-binding fibroblast growth factors play important roles in the regulation of cell survival, cell division, angiogenesis, cell differentiation and cell migration. They are potent mitogens in vitro. Secreted. Cytoplasm. Cytoplasm > cell cortex. Lacks a cleavable signal sequence. Within the cytoplasm, it is transported to the cell membrane and then secreted by a non-classical pathway that requires Cu(2+) ions and S100A13. Secreted in a complex with SYT1. 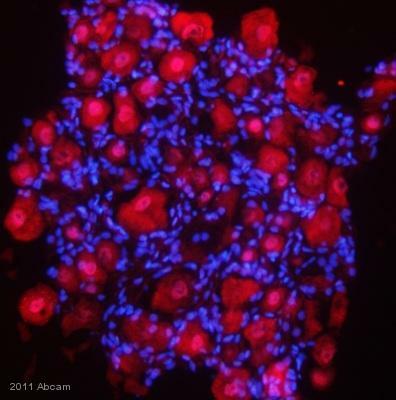 ICC/IF image of ab9588 stained HepG2 cells. The cells were 4% formaldehyde fixed (10 min) and then incubated in 1%BSA / 10% normal goat serum / 0.3M glycine in 0.1% PBS-Tween for 1h to permeabilise the cells and block non-specific protein-protein interactions. The cells were then incubated with the antibody (ab9588, 1µg/ml) overnight at +4°C. The secondary antibody (green) was ab96899, DyLight® 488 goat anti-rabbit IgG (H+L) used at a 1/250 dilution for 1h. Alexa Fluor® 594 WGA was used to label plasma membranes (red) at a 1/200 dilution for 1h. DAPI was used to stain the cell nuclei (blue) at a concentration of 1.43µM. Immunohistochemistry (Frozen sections) - Anti-FGF1 antibody (ab9588)Image courtesy of Duygu Daglikoca by Abreview. ab9588 staining FGF1 in rat dorsal root ganglia tissue by Immunohistochemistry (Frozen sections). Tissue was fixed in paraformaldehyde and permeabilized using 0.25% Triton X-100. Samples were then blocked 0.25% BSA for 1 hour at 25°C, then incubated with ab9588 at a 1/200 dilution for 16 hours at 4°C. The secondary used was a donkey anti-rabbit polyclonal conjugated to rhodamine, 1/500 dilution. Publishing research using ab9588? Please let us know so that we can cite the reference in this datasheet. Please let me know whether this antibody is suitable for IHC on paraffin embedded human section. This antibody has never been tested in IHC on formalin fixed paraffin embedded sections, therfore we can't guarantee results.